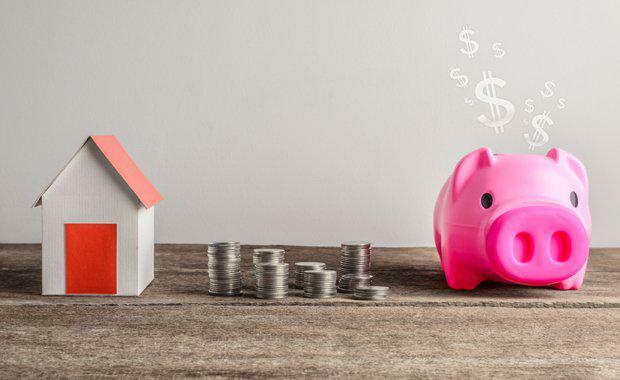 The strong capital gains evident across the Sydney and Melbourne housing market have created a significant boost in wealth for home owners who were fortunate enough to own a property through the latest growth cycles. However, CoreLogic head of research Tim Lawless said the rate of capital gain has been remarkably lower across other markets with home owners outside of Sydney and Melbourne now seeing far less accrued equity from their housing assets. “On the flipside, there are also those housing markets where dwelling values have fallen, particularly in areas associated with the mining sector where a larger proportion of properties in these regions are now worth less than their original purchase price," he said. When CoreLogic measured the wealth effect, their analysis measured two aspects of wealth accumulation via the housing sector: What proportion of dwellings are now worth double their purchase price and what proportion are worth at least 10% less than their purchase price. Nationally, the proportion of dwellings where the value of the property was at least double the purchase price has slipped over the past decade falling from 45.4% of dwellings in 2007 to 39.1% in 2017. The slump was evident across regions outside of Sydney and Melbourne where capital gain conditions have been much softer over the past decade. The proportion was highest in Sydney, where 48.1% of dwellings are now worth at least double what their owners paid for them; ten years ago the proportion was much lower at 37.2% Melbourne follows close behind with 47.3% of dwellings worth at least twice what their owners paid (up from 38.1% ten years ago). 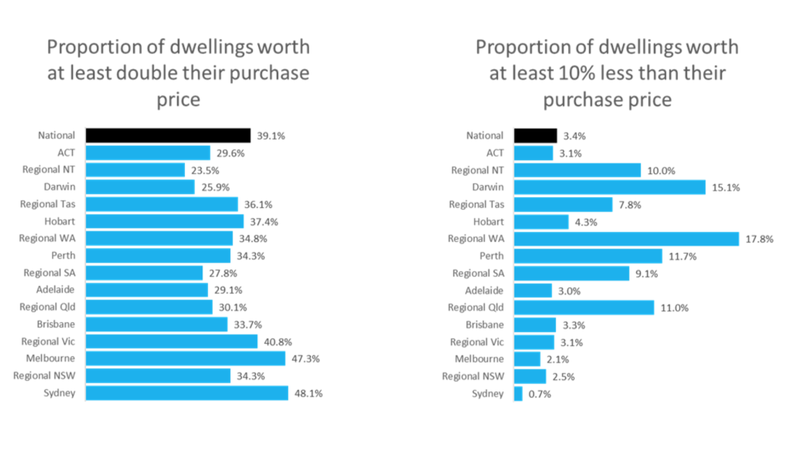 The remaining capital cities show a much lower proportion of dwellings that are worth at least double their purchase price, ranging from 25.9% of dwellings in Darwin to 37.4% in Hobart. Across the broad ‘rest of state’ markets outside of the capitals, regional Victoria stands out as showing the highest proportion of properties worth at least double the purchase price at 40.8%, followed by regional Western Australia at 34.8%. The high proportion of properties worth at least double their purchase price across regional WA may come as a surprise, given the weak performance of the housing market across this region over the past five years, however a decade ago the proportion was substantially higher at 60.8%. Over the past decade, the proportion of properties valued at less than 10% of their purchase price has risen slightly from 3.2% to 3.4% between 2007 and 2017. The national figures hide a significant difference between the major regions of the country. The highest proportion of dwellings worth at least 10% less than their purchase price can be found in regional Western Australia, at 17.8%. Darwin (15.1%), Perth (11.1%) and regional Queensland (11.0%) have also recorded a significant proportion of dwellings where values have slipped more than 10% below the purchase price. Ten years ago only, while the mining boom was in its early stages, regional Western Australia and Perth were recording the lowest proportion of dwellings where the value was more than 10% lower than the purchase price. In 2007 only 1.1% of Perth properties and 2.3% of regional Western Australian properties fit this profile. The lowest proportion of dwellings with a valuation more than 10% lower than the purchase price can be found in Sydney (0.7%) and Melbourne (2.1%). Ten years ago, 7.1% of Sydney dwellings recorded a valuation that was more than 10% less than the purchase price, highlighting the effect of strong capital gains post GFC. The Bowen Basin town of Dysart topped the list with 65.7% of dwellings showing a valuation that is at least 10% lower than the purchase price. Queensland’s Gladstone Central was close behind at 64.2% followed by South Hedland in the Pilbara region of Western Australia at 64.0%. “The good news for many mining regions is that housing market conditions seem to be moving through the bottom of their cycle," Lawless said. "Transaction numbers are generally rising and advertised stock levels are reducing which should help to promote some value recovery in these regions.